Following on from the replenishment of amiibo supplies locally last month, Nintendo has today locked in the Australian and New Zealand release of the fourth Super Smash Bros. amiibo wave for 25th April, which aligns with the national commemorative occasion, Anzac Day. This could prove a problem given the closure of shops on this particular date. The local launch of the fourth wave of amiibo lines up with the European release, unlike the Australian debut of 3D Out Run originally expected to arrive alongside this week's wider PAL release before a tweet from SEGA late last week revealed the remaining 3D Classics line had been delayed for down under. Let us know in the comments if any of the soon-to-be released Super Smash Bros. amiibo or cover plates interest you, or if you're just trying to come to terms with the fact 3D Out Run is still not available in Australia. And so NA are now the only ones who don't have a release date for this wave. I totally expect preorders will happen very soon before or after Gold Mario's release. @shaneoh I didn't preorder, so I'll be taking my chances on release day. Hoping to get Charizard and Pac-Man. I'm checking Amazon every day to pre-order ASAP. Almost didn't get my Ike because I put in my pre-order in a few days after they went up. Pacman, Ness, Lucina and maybe Robin. Unfortunately I can't find a store or a site to preorder since they are unavailable/soldout. Just don't presale out my Lucina!!! I need her for smash and Codename Steam!!! I feel sorry for kids who might want these things as they'll be gone in a day. Pacman, Charizard and Wario are mine! Yes! Can't wait! @Sanya Along with Jigglypuff and Splatoon amiibos coming in May in South Africa. How many more wawes of Smash amiibo can they still release? I don't own Smash Bros, so I don't really know how many characters are there left. Ness! Charmazing! Pac-Man! Pika and Kirby coverplate! MINE. 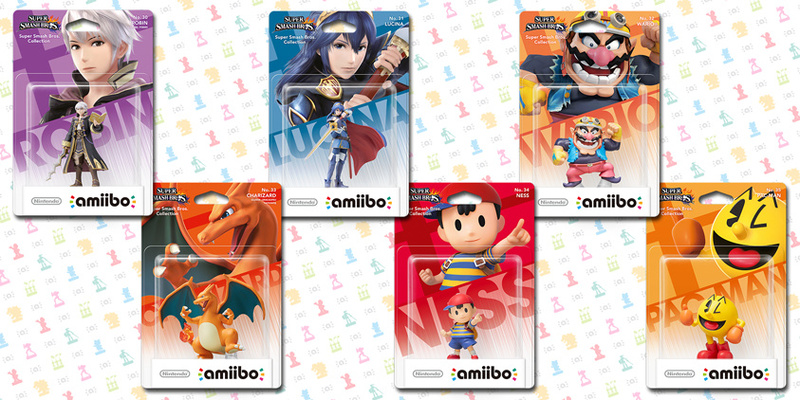 I can't seem to find a place to pre-order Robin/Lucina/Pac-Man/Ness anywhere, at least I've got Charizard and Wario ordered. I wish we got the cover plates. But Nintendo thinks North Americans are too stupid for more than 1 system. My kid was actually excited to see Charizard, but he was excited about Bowser too but whenever we actually see him in store he just says "meh". He was excited for the Rumble U Pokemon as well but we only got the first 1 for free and never bothered w/ the rest. Someday I suppose a Pokemon amiibo game will come, either a Colosseum type game or Pokepark 3, but they'll need to go w/ the cards on those. Probably the main reason they decided to go create amiibo cards is for a Pokemon amibo game. They may make 2 dozen Pokemon toy amiibo - Pikachu and the 18 starters - but not all 700+. Sweet! 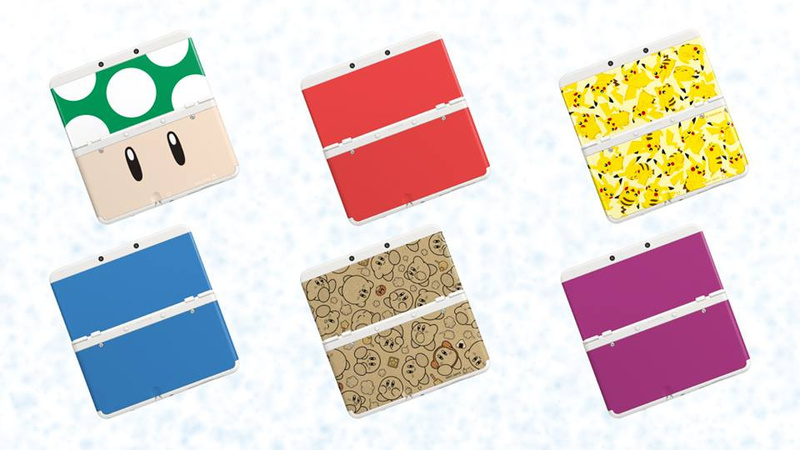 Both the Cover Plates sets I intended to order from Japan/Europe will be available here! Now all that's left is for the black New 3DS to come out in Australia and my plans will come to fruition! MWAHAHAHAHA! 13 characters left. So one or two more waves, I guess. I managed to preorder Wario on Amazon UK, but I still want Pacman and Lucina. Hopefully Lucina and Robin will have more normal faces. Marth's was straight up disturbing. I preordered a Wario amiibo ages ago but cancelled it when the rumour mill spat out the fact a Wario in his proper attire may arrive eventually. I'd still like to see Captain Toad & Toadette Amiibos. And yet NA is still in the dark with pre-orders. @Grumblevolcano They come out on the 24th in America but for some odd reason there is no pre-orders for them yet. TRU already stated that they won't do pre-orders and its first come first serve but they are limiting the purchases to 1 per costumer. Hopefully GameStop, Target and Best Buy do not follow this because I rather having secure than having to camp at 2am in the morning for this sunny side up. I have not seen any places where you can pre-order these things. They sell out in 5 minutes on release day over here (Australia) and they are never restocked. I would buy maybe 1 or 2 from this wave but I have 0% - 2% of actually finding any of them anyway. Many stores (that were and should be carrying these) near where I live, don't even have ANY of them now. As for people from other countries saying that Peach, Luigi and Yoshi are easy to find - just try finding them over here. Your only chance to get any of these Amiibos in Australia (from any wave) is to pay the scalpers on eBay (or at least that has been my experience). I think I will pass. As for the Australian replenishment - what resupply? Obviously the stores near where I live did not get any of these. This stressing out about amiibo is ridiculous. It shouldn't be happening. There should be re-releases of previous waves so people have more chances to get the amiibo they want to get. Hopefully i can preorder the amiibo I want. I didn't get Ike, and I preordered him. I'm not sure if I want to bother anymore. I got the Lucina Figma on preorder so that will be enough. @Nintendzoey I'm not sure how much they restocked, but my local EBgames sold out of amiibo's on day 1 when smash came out, and never got anymore since. After hearing about the restock I dropped in there this week and they had 1 kirby and 2 links so I bought the 2 links. (one for friend) so now I have 4 amiibo's but they are too frustrating to collect in Australia you are right. @Nintendzoey I only see Japanese stock in my local Aus stores.Most JB's have some. So preorders should be right around the corner. Im guessing they start the day Mario Party 10 is released, that way when people are picking up their game and new figures the sales associates can tell them to preorder the new ones. Im looking forward to everyone except Wario. "Who is that horrible little creature?" "Tell him I hate him." @Seren77 I tried looking for them may times (the latest being 2 days ago). I also enquired about them to staff but was told that they still did not have any available. @MadAdam81 Yeah, my local JB restocked a variety of amiibo the other week. I was lucky enough to get a Shulk after missing out on him during the release of Wave 3. @Liam_Doolan I just wish that some (or any at all) places near where I live could have restocked some. I guess that I was destined to just be one of the unlucky ones who will never be able to get a single one. Well, not unless I pay almost 3 or 4 times what they are actually worth. @Nintendzoey Sorry to hear. What amiibo do you actually need/want? I managed to get all of Wave 1, only got Captain Falcon in Wave 2, and in Wave 3 got Sonic, Mega Man and Toon Link on release, and as mentioned above acquired Shulk about a month later thanks to the restock. I'm aiming for Charizard and Pac-Man in Wave 4, but I'm not getting my hopes up as I haven't preordered. Would also like Toad when he's released this weekend. @Liam_Doolan I would just be grateful to find any of them in the stores at all. I like the majority of characters who have been released so far. I can't justify paying the extortionate prices I have seen for them though. My cousin and I both wanted the original (wave 1) Yoshi. I almost bought it but stupidly decided that I would just get it (if he didn't) in the not too distant future. This was before they became so highly sought after. We can only find him for $40 or more now though anywhere we look. There is a slim chance we may be able to get him in the new Super Mario Brothers series about to be released. It would have been nice if we could have gotten the original though. I don't like hearing that people have bought truckloads of ones that they don't even want (just to make a profit) when there are people who can not even get their one favourite character now. There really needs to be a limit of 1 per customer for each Amiibo, if they are this hard to find. I don't think it is fair at all to let other people constantly miss out on the ones they want, when other people are buying them just to make a profit.